In school, we learn the 3 R’s – reading, writing and arithmetic. I prefer the three P’s – personal, portable and pleasurable. These are the chief characteristics of a hand pie. 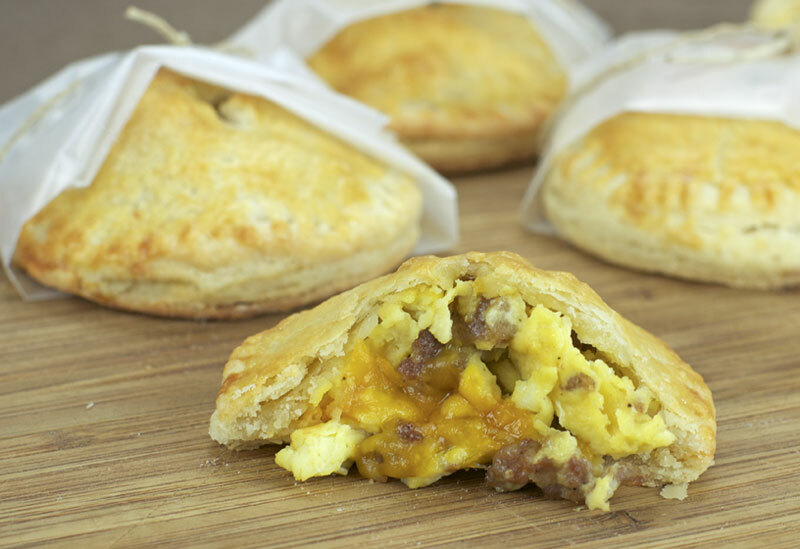 In this article, we’ll bite into a savory Sausage, Egg & Cheese Breakfast Hand Pie with a flaky, buttery crust and a warm scrambled egg filling accentuated with Cheddar cheese. 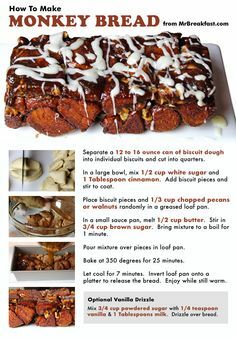 Be advised: This recipe is a bit time-consuming. Making everything is extraordinarily easy, but you need to chill the dough before you roll it and chill the assembled pies before baking. This adds a couple hours to the process. Some people might not like that, but I found that it gave me time to take a shower, watch an episode of Mad Men and set up the lights to take these pictures. 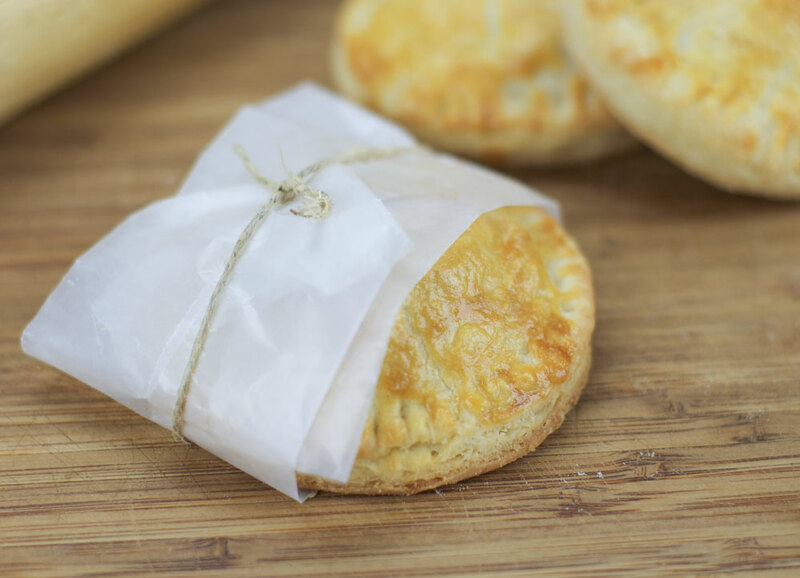 I’m calling this article “Breakfast Hand Pie #1″ because I’m already excited to try other variations. On the savory front, I’d like to do something with sausage and gravy. Eating biscuits and gravy while driving seemed like an impossibility before today. As for sweet varieties, the possibilities seem endless. Berries, jams, peanut butter, chocolate, chopped nuts and Nutella will all get the hand pie treatment before I’m done. For the short and sweet printable recipe, click here. The ingredients in the crust are very simple: flour, sugar, salt, water and butter. It’s amazing that these pantry staples come together to make such a great taste and texture. 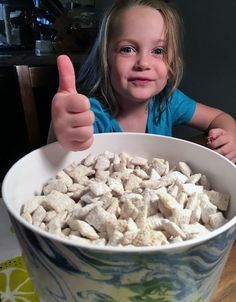 Basically, you mix the flour, sugar and salt together and then cut in small cubes of butter until everything is coarse and crumbled. You can use a food processor for this, but I prefer to use the best kitchen tool of all… the human fingers. Gently pinch the butter into the flour mixture. 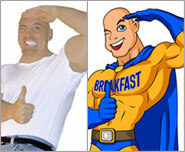 Look for a final consistency like granola or the crumb topping of a muffin. As a rule, the largest piece of butter remaining should be no larger than a pea. When you think you’re done cutting in the butter, keep blending for 30 more seconds. It’s all about even distribution through the dough. Next, mix the dough with a spatula while streaming in ice water. The second a dough starts to form, stop with the water. Ball up the dough. Flatten it to a disk. Wrap it in plastic and refrigerate for two hours. The filling is Basic Breakfast 101. Fry up some breakfast sausage over medium heat. Crumble it with a wooden spatula as it cooks. Beat some eggs with a little milk. When the sausage starts to brown, add the egg mixture to the pan. Scramble up the eggs just until they begin to set. They should be ever-so-slightly under-done. They’ll get a chance to finish off in the oven. Assembling hand pies is actually quite fun. You just roll out the dough to about 1/8 inch and cut out as many disks as you can with a biscuit cutter. When I turned out my chilled dough, I noticed a couple larger chunks of butter in it. So, I ended up rolling the dough to a thin sheet, folding it over into itself a couple times and then rolling it once more. For some recipes, this can be the kiss of death – creating cracks in the final product. 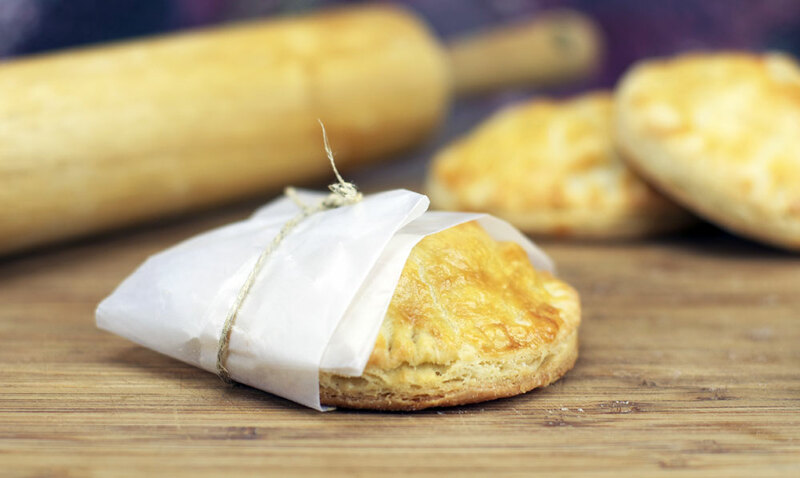 For this recipe, double-rolling only seemed to make the pastry more flaky. Bonus! Take half of the disks (the bottom of your pies) and brush some beaten egg around the edges. Sprinkle some cheese in the middle and dollop on a heaping Tablespoon of filling. Top each of these with a corresponding top disk. For the upper crust, you can roll or stretch each individual disk to make them the right size. Crimp the edges of the assembled pies with a fork. 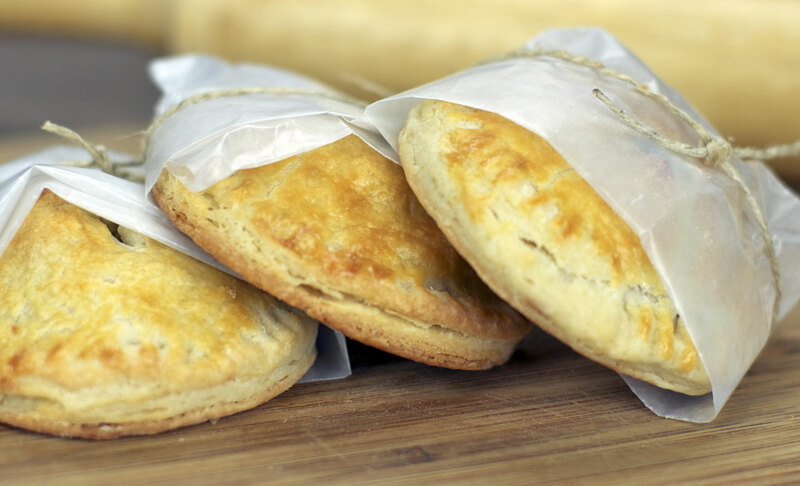 Use the biscuit cutter to cut around the crimped edges to make the pies uniformly round. Place the pies on a parchment-lined baking sheet and refrigerate for 45 minutes. When ready to bake, brush the top of each pie with beaten egg and cut a small slit so steam can escape. Bake for 16 to 20 minutes at 425 degrees until golden brown. The hand pies pictured here took 18 minutes. Let them cool about 5 minutes and dig it. You can also refrigerate them to have homemade hot pockets the next morning. About 35 seconds in the microwave warmed the filling just right. Alright, you’ve got to “hand” it to me… that’s a lot of words about a fairly small pie. 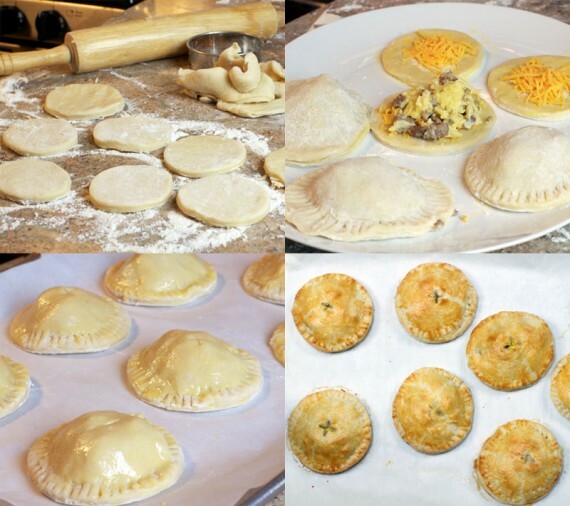 If you try making your own hand pies, let me know. Send a picture and I’ll put it on the site. Goodbye for now. Or should I say, good-pie! I like this idea. I’d go for bacon instead of sausage though. I’m making these tomorrow and will probably make a few different types. Thank you! 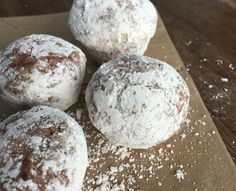 I made these last night using Morningstar Farms sausage and they’re great, except the crust is too sugary. I wonder if it was a misprint to put 1/3 cup sugar in these? It would be fine if you were making dessert ones, but it’s a little weird with this filling. I used the top of a large plastic cup to cut these out, and ended up with the right amount, anyway. I made these without the final refrigeration step, and they look exactly as the picture shows. It was about midnight, so I didn’t want to wait around for them to chill after assembling them, I just brushed them with egg and baked them. I have to wonder why it is made with what should be a pie crust. Because the sugar is really apparent when made with the egg and “sausage” filling. I’ve made lots of crusts that don’t have sugar (or at least, a lot less than 1/3 cup), so have to wonder why these do if they’re not intended to be dessert pies. Aside from the sugary crust, these were pretty good.